Travel back in time to the ancient land of the Bible and prepare for an exciting tour of one of the world's most treasured books. Learn how stories and customs from the Bible are part of our lives today, from the names that we're given (David, Ben, Miriam, Rebecca) to the names of the places where we live (Bethel, Zion, Jericho); from the movies or plays that we watch (The Prince of Egypt) to the songs that we sing ("Go Down Moses"). Selections include a day in the life of a kid in ancient times; archaeological digs for Bible detectives; Bible recipes, crafts, and projects; and quizzes, brainteasers, and jokes. Kids' Catalog of Bible Treasures by Chaya M. Burstein was published by Jewish Publication Society in September 1999 and is our 61742nd best seller. 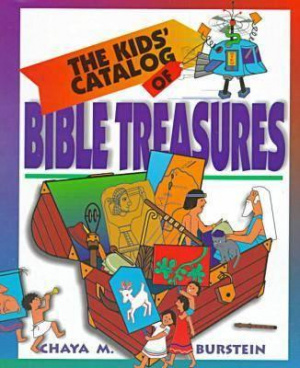 The ISBN for Kids' Catalog of Bible Treasures is 9780827606678. Be the first to review Kids' Catalog of Bible Treasures! Got a question? No problem! Just click here to ask us about Kids' Catalog of Bible Treasures.